Great Tibetan Dictionary (Tib. ཚིག་མཛོད་ཆེན་མོ་, tsik dzö chenmo, Wyl. tshig mdzod chen mo) or in full the Great Tibetan-Chinese Dictionary (Tib. བོད་རྒྱ་ཚིག་མཛོད་ཆེན་མོ་, bö gya tsik dzö chenmo, Wyl. 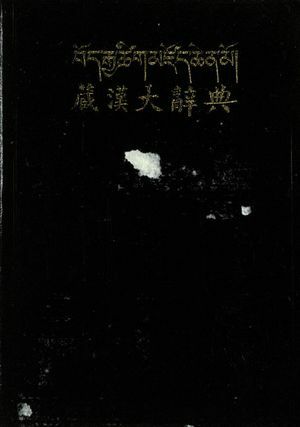 bod rgya tshig mdzod chen mo) — a dictionary created by a team headed by Alak Zenkar Rinpoche on orders of the Chinese government, from 1978 to 1985. It was published in Beijing by the Minorities Publishing House in 1993. From July 1992 to April 1999, Alak Zenkar Rinpoche helped to translate the dictionary into English with Dr. Gyurme Dorje at the School of Oriental and African Studies in London. This page was last edited on 13 February 2019, at 07:32.